One of our newest malas has 108 hand strung and individually knotted beads, and includes a 4 inch tassel at the bottom. It incorporates stunning 8mm matte black onyx, finishing with a larger 12mm matte onyx guru bead from which the tassel hangs. Onyx can provide strength and support during trying times, absorbing negative energy. It is also said to promote self-control and stamina. It is a soothing stone, helping to alleviate fears and worries. Black stones have protective energies in the sense that black is the absence of light, and therefore, can be used to create invisibility. The texture of it as well as listening to the beads come together when counting is just amazing. I really enjoy my beads. Thank you! Kaitlin, thank you for your feedback and awesome picture! We're so happy to hear that you're enjoying your mala and we hope the onyx beads provide protection in your life. Mala beads can greatly aid mediation and yoga practices. We truly appreciate you taking the time to write a review and thank you for supporting Himalayan artisans! Absolutely fabulous. Soft and charming to touch. I'm in love with this mala. Ace, thank you for your feedback! We're so happy to hear that you love your onyx mala, it's one of our all time favorites. We appreciate you taking the time to write a review and thank you for supporting Himalayan artisans! 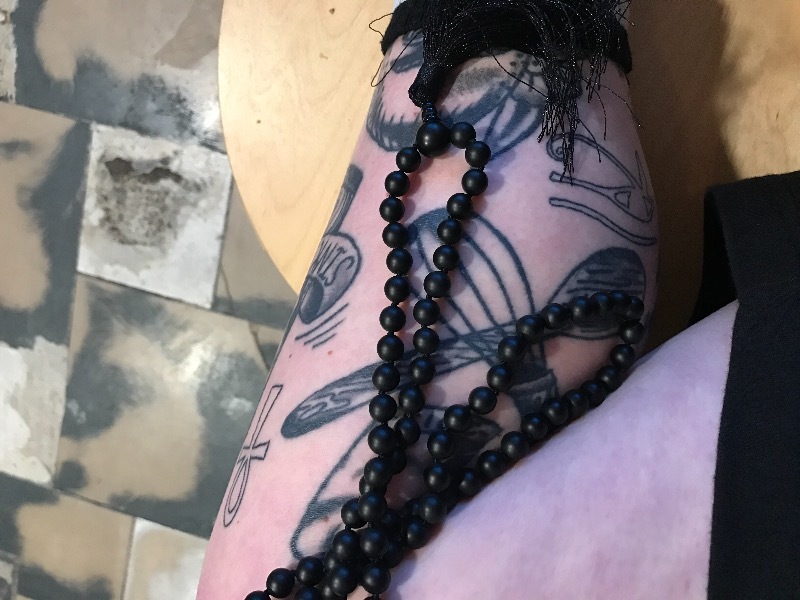 My bone Impermanence Mala with black beads and skull spacers & guru bead has been my daily mala for some time now because of its focusing impact on the transitory nature of all things the mere appearance of reality. However, I now use the Matte Onyx Protection & Stability Mala nearly every day also or instead because the knots make it is easier for counting despite the smaller size of its beads and because it does indeed have a visceral impact of a "drawing out" of stress or an absorption of negative emotions. Both are quite calming and centering to use, albeit in subtly different ways (head or heart perhaps). Thanks, yet again, to The Dharma Shop for offering such well-made, thoughtful objects to support the practice. ECat, thank you for your feedback! We're always excited to read reviews from customers who truly love their products and we're happy to share these beautiful pieces with you. It is always nice to hear that our products bring peace and calmness to our customers lives. Thank you for taking the time to write such a descriptive review and thank you for your continued support! This is a beautiful, soothing mala. As soon as I put it on, I felt a sense of well being and serenity, which is exactly what I needed. It has a rare, simple but elegant beauty to it; I loved the length too. Precious mala.